Stay out of each other’s blood bubble, was one of the recommendations for the day provided by Truckee Trails leader, Kevin Starr. Working on the Sawtooth Trail, a prominent mountain biking trail for Tahoe Mountain Guides (TMG), our group of over 20 volunteers dug drainage ditches and cleared menacing brush equipped with a solid quiver of hand tools, a complete demonstration from our leader, and much deserved burritos after a job well done. 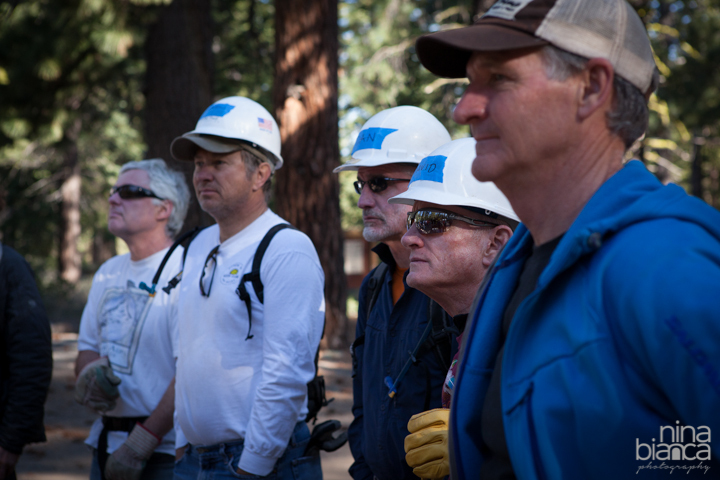 Owner of Tahoe Mountain Guides (TMG), Ken Long and several volunteers dutifully listen to instructions for the day. Kevin Starr shows us the proper way to carry and use the tools. When volunteering under the umbrella of the National Forest, hard hats are a mandatory element of the uniform. Ken lets us know burritos will be served trailside for those who work hard. Checklists, diagrams, and standard operating procedures manuals were also provided for those who learn best through reading. The proper way to dig a drainage ‘spoon’, demonstrated by Kevin Starr. Kevin was kind enough to preflag all the problem areas to be worked. Working with tools is serious business. Seriously, one can loose an eye or a finger with those things. Therefore, Kevin tells us to “stay out of each other’s blood bubble,” which basically meant to give one another at least 4 feet of space when working. Work it. Just like this. Breaking into strategic teams based on tool type, we learn about the other people in our little Truckee/Tahoe community. Koda, with his (I think it was a boy dog) Forest Service bandana, was a huge help by clearing sticks off the trail. Tahoe Mountain Guides best, Zach Fenn keeping it light and fun, as always, in the woods. What a beautiful Sawtooth Trail! Taking a break in the best place in the world, the woods! Displays of teamwork was going on all over the place. A true Truckee Trails volunteer. Thank you for organizing such a great event. The Sawtooth Trail has many great views to the west and of Castle Peak (clearly not pictured here). Getting rid of those tree snags. Another TMG guide, Alex Aparicio is seen here giving back to the trail which serves him oh so well over the summer. Clearing the brush from the drainage spoon. The McLeod, pronounced mc-cloud, is a popular tool amongst mountain bike trail builders. Raking away the duff and pulling out the debris from the drainage spoons, volunteers made easy work of their trail maintenance day. A great big THANK YOU to Truckee Trails Foundation, Tahoe Mountain Guides, Cyclepaths, and the Tahoe Sports Hub for helping make our Sawtooth Trail that much more awesome!